Suicide Prevention: Learning how to help or prevent a suicide! 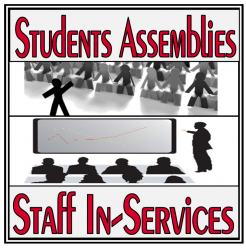 The In-Service & Student Assembly Model is designed to use this material to reach a large group of student and adults in a single setting and when there are time constraints to disseminate the information. Keys’ utilizes multiple methods to present the information like; roll plays, hands-on-activities, demonstrations, visual tools and other more. Keys’ Assemblies are to teach student ways to master essential life skills by encouraging critical thinking, to introducing them to new or impactful information. Keys' In-Services is used to refresh skills and knowledge or add new material and examples of best practices needed to meet staffs current job responsibilities. This model seeks to update existing knowledge and skills, or add new ones. This 11 page Booklet is for the Observation component of the Risk/Threat Assessment Model, which is for the complete staff population. In the past, Observers have missed these students. This booklet is designed to educate and provide information to help in recognizing students that need help. So what are Early and Imminent Warning Signs? Keys' has four different types of book marks targeting students and parents. This workbook is part of the "Bullying Stops when Respect Begins" School Campaign. It was designed by Mental Health Experts coming together to help students learn how to solve the bullying problem and have a little fun in the process. The different topics are designed to help answer questions like; what is a bully, a victim, how to Handle bullies, how to change the school enviroment and more. FREE with Training. Used to provide each Crisis Team Member with a reference flip chart of procedures needed. It is a more detailed reference flip chart then the Classroom Flip Chart. Learn more about Training Model these Material support. Check out Keys' Training that these Material support.